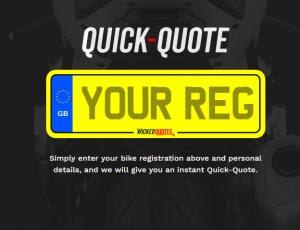 Wicked Quotes are very proud to launch their Quick Quote for Motorbike Insurance facility. We know you don’t like completed long winded forms and generally you just want a Quick Quote of the cost of your motorbike insurance – so that’s exactly what we have created. You can get a quick quote within a minute by answering ‘8 Simple Questions’. The quotes also give you three options for cover levels; Comprehensive, Third Party Fire & Theft & Third Party Only – leaving you to decide your preferred options. As always, if you need to discuss your quote, we are available on the phone to answer any questions. You can also continue with the quote and progress to completing a ‘full quote’ and purchase cover online. In order to give you a Quick Quote, we have had to include some assumptions in the questions missed out – if you don’t match these assumption exactly, you can proceed with a ‘full quote’ and if there are any changes to the price, this will be confirmed at the end of the process. Alternatively, you can call us on 0344 8800 962, where we will be able to advise if this affects the price quoted. Please note there may be some scenarios where the Quick Quote facility may result in a ‘no quote’ answer, in these scenarios, if you contact us via the Enquiry Form or by phone, we may possibly be able to still give you a quotation. The build of the facility is not vast enough to cover every possible scenario, so it is worth giving us a call. To see how the Quick Quote facility works, try it out below.